A low-pressure wastewater disposal alternative offers a cost-saving installation solution for wastewater and raw sewage disposal. Alcatraz Island is probably best known as the place where an “inescapable” federal penitentiary housed some of the most notorious convicts–including Al Capone; George "Machine Gun" Kelly; and Robert Franklin Stroud, the “Birdman” of Alcatraz. In 1963, U.S. Attorney General Robert F. Kennedy decided to close the penal complex on Alcatraz Island, and in 1976, Alcatraz was listed on the National Registry of Historic Places. The plan was to open the island for tours and educational opportunities. In 1972, the Clean Water Act became the principal federal law in the United States governing water pollution and discharges to navigable waters. Alcatraz prison had no sewer system, and during the time it was open, wastewater and raw sewage were directly released into San Francisco Bay. How could the Park Service open the island, offer tours, actively welcome thousands of visitors and meet the Clean Water Act's wastewater guidelines? The answer came with the installation of a low-pressure wastewater disposal alternative that offered a cost-saving installation resolving the problem with minimal disturbance to the natural or manmade environment and requiring zero rock blasting. A manufacturer of grinder pumps for pressure sewer systems used a low-pressure system to solve the problem. “It consists of a network of pipes and grinder pumps installed at sanitary stations on the island,” said Environment One President George Earle. “The grinder pumps collect and pulverize sewage and push the resulting slurry to a holding tank through unobtrusive small-diameter (1 ¼ in.) pipes that conform to the natural topography. “Unlike conventional gravity-central sewers, which can use up to 24-in. pipe and require deep excavation, the E/One Sewer system provides minimal disruption to the environment or built features.” The low-pressure system employs technology that is known for its minimal maintenance; low, upfront costs; reduced operating expenses; and ability to be installed at any site, regardless of landscape challenges. 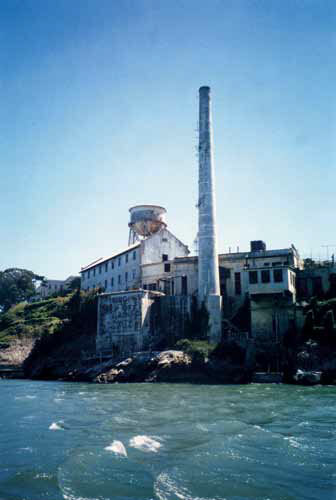 “There are two duplex grinder pump stations and one simplex station installed on Alcatraz. E/One's system grinds the solids, uses small diameter pipe to transfer sewage to a holding tank for transport off the island, incorporates durable pump components that are compatible with saltwater flushing and is easy to service," said Don Reppond of Correct Equipment, E/One's local distributor. Two of the three grinder pumps positioned on the island are above ground and one is below. Pump One sits atop the prison cell building. It pumps ground-up waste into a slurry which flows through a 1-¼ in. pipe to ground level and then another 200 ft along the surface to a dockside collection tank. Pump Two, which is above ground and housed in an open-air stainless steel container, sends slurry via a 1-¼ inch line for 500 ft to the dockside holding tank. Pump Three, underground, pumps the slurry 1,500 ft to the same tank. Alcatraz Cruises, the company that brings tourists to the island, has a service agreement to bring fresh water, fuel and supplies to the island and dispose of trash and wastewater. Using a specially equipped Mechanized Landing Craft (LCM 8), Alcatraz Cruises pumps sewage and wastewater from the on-island storage tank to a built-in container on the LCM 8. The LCM 8 is also used to carry water, fuel and supplies from the mainland to Alcatraz. Upon arrival in San Francisco, the waste is pumped from the onboard tank directly into the city's sewer line, where it flows through four-in. pipes to the main before arriving at the sewage treatment plant for processing. The procedure transfers 6,000 gal each day and 2.19 million gal/1,095 tons of waste annually. “The pumps run and the process moves waste to the collection tank regularly throughout the day. There is minimal but continuous service and maintenance done to ensure uninterrupted functioning of system. This is particularly important given the 1.4 million island visitors, the use of salt water for flushing and harsh salt air environmental conditions on Alcatraz Island,” said Cameron Clark, Director of Environmental Service at Alcatraz Cruises. The Golden Gate National Recreation Area is one of the largest urban national parks. It occupies miles of California's coastline and includes a large area of San Francisco and Alcatraz Island. The evolution of Alcatraz from a harsh, inhospitable place of discomfort to a popular tourist attraction is a tribute to the far-reaching thinking of the Park Service to preserve and share a valuable part of American history. Alcatraz was considered inescapable. From 1934 to 1963, most, if not all, of the prisoners incarcerated at the maximum-security prison wanted to get off “The Rock,” as it was known. Today, about 5,000 people escape to the island each day for special programs and guided tours. Alcatraz Cruises, LLC, transports 1.4 million people annually from its dock at Pier 33. The private company has the exclusive concession agreement with the National Park Service to take people to and from the island. The cruise boats run year round, 10 times daily during the winter and 14 times during the summer. The National Park Service's “Alcatraz Development Concept and Environmental Assessment” plan, approved in 1980 and made public in 1993, doubled the amount of the island that was accessible for public visitors to enjoy its scenery, observe nature, appreciate the gardens and explore the island's rich history.